Recently, I learned some things about my own country that in all honesty really upset me. I was raised believing that the United States was founded completely on Christian principles and that all of our forefathers were devout Christians. Somehow that thought gave me great peace along with pride that I was born American. I still have great pride in America. 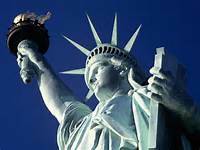 I believe we have been the greatest nation on earth and the most Christian nation ever known. I also believe God's hand of providence has been on us from the very beginning despite what you will learn in this post. But having said that, let me know give you a very general outline of how our capital city was built and laid out, in addition to some other monuments. First I must quickly define FreeMasons. Some of you may already be aware of who the Masons are. They are a secret religious society that began hundreds of years ago that is directly connected to the occult. Today they have morphed into what some call the Illuminati. That's all I'll say here, but I suggest you do your own homework on them. As some of you know, the Capitol is the main seat of government in our nation's capital. 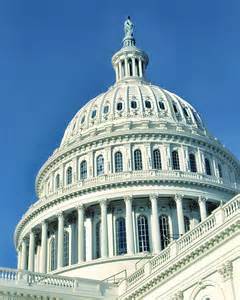 It is where congress meets and where all major decisions are made that affect our country. But did you know that the building itself was designed and built by freemasons? In fact, the cornerstone of the capitol building was laid with Masonic honors on Sept 18th, 1793 under the auspices of the Grand Lodge of MaryLand. 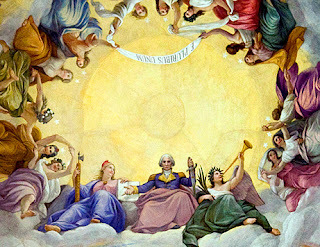 It may pain some of you to know that George Washington presided over the ceremony in full Masonic attire, assisted by several prominent Masons. Directly beneath the dome is the crypt and in the middle on the floor is a bronze sun symbol. 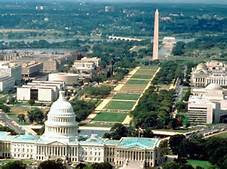 (for the sun god) This symbol is geographically the center of Washington DC. There are also many pagan god statues littered all over the Capitol building, including the god Mars found near the entrance. spiritual entity is born, a sort of spiritual energy or power. You'll see this same formation at the Vatican. In fact, the layout of the city is in the form of an inverted pentagram. Due to space constraints here, I'll let you do your own homework on this one. Have you ever wondered why there is a massive obelisk in the center of the city? Did you know that the obelisk has a very satanic history associated with it? It is actually the phallic symbol, which is the male sexual organ (sorry to be so graphic). It is a symbol of power and was often used in occult rituals through the ancient past as a form of worship of the god of fertility. This same symbol was similar to the Asherah pole around which people would dance and engage in sexual orgies as a form of worship. It is where we get the stripper pole from. But I digress. There is also a similar obelisk at the vatican. The US One dollar bill is full of masonic symbols. The Circle on the left contains the all-seeing eye sitting atop a pyramid. As most of you know the all seeing eye is the eye of Lucifer and the pyramid represents him sitting atop his throne or mountain keeping an eye on mankind. The words around the eye on the dollar bill are: "Annuit Cceptis Novos Ordo Seclorum" which means "Announcing the Birth of the New World Order". The Occultist seek to place the world under one world government, and we can see here that they have been planning this for a long time. 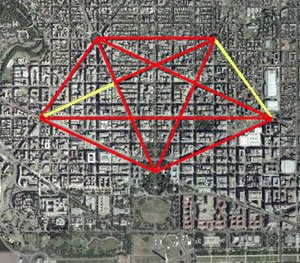 There are many more occult symbols found in Washington DC and other cities in America and in many of our historical objects, but I hope this gives you a brief overview of some of them. If you haven't heard this before, you are either thinking I've lost my mind or you are in complete shock. However, I highly suggest you do your own homework on this. Remember that often times they will give these symbols very innocent meanings, but it's important to look deeply at each symbol and research its past to find out the truth. I would also like to note that George Washington often spoke of God and wrote some of the most beautiful prayers to our Father. However it is true that he was a Mason. Whether or not he was aware of its occult ties, I have no idea. Having said that, and even knowing that many of our founders were involved in the occult, I still believe God blessed the USA because there were many true Christians here. It was indeed a Christian nation for many many years, and I thank God for this country. However, it does appear that there was another agenda in its founding that may be coming true in these last days. God help us all. I knew about most of this....not surprising. I guess it all boils down to how strong your faith is in God. These buildings, statues, etc have been around for centuries and aren't going anywhere. So, all we can do is keep the faith and not believe the 'lie'. No matter their agenda, deceivers will be defeated one day and we will be there to watch them fall. Even though the Capitol, the Statue of Liberty and the Monuments are large, the deceit is subtle and therefore can easily draw people into the deception...without them even being aware of it. (am I making any sense?) As long as we are strong in our faith, God will keep our eyes open to deceit, no matter how subtle it is. The Purpose of Freemasonry. The basic purpose is to make "better men out of good men." There is an emphasis placed on the individual man by strengthening his character, improving his moral and spiritual outlook, and broadening his mental horizons. From this, one would assume the Masons to be a 'good' group, thus bringing Washington into the fold would have been easy. I choose to believe that Washington was a God-fearing man, who's faith may have wavered and allowed him to be duped by the wrong crowd. Being duped and actually believing something are two totally separate things. Thanks for your insight, MaryLu - I knew some of these things, however, not all. As with Debbie, I am not surprised and agree with her comments. I'm sharing this and praying readers take note and give your post some thought. I did know this but I was raised old school Pentecostal . Many churches do not even speak of the occult and that for as long. as Jesus has been preparing a place for us, satan has been planning and creating his domain. His has always been one of deceit and deception. Satan always introduces his evil as something to help man..but then the lie begins and man begins to think of himself as a god. That is the selfish society in which we live. The old saying ( lie) is coming back...live and let live....sounds good and peaceful but is just a cover for all the sinful, evil actions being acceptable. We need to be in consent prayer....God save us. We ain't seen nothing yet! I'm so glad He found me and I am His!!! Thank-you for such an enlightening post, MaryLu. I also was aware of some of what you shared, but surprised by most of it ! Wow ... the things we just "accept" or take for granted ... (like the various monuments, etc) -- thinking they are relatively 'good', but in reality ... are from evil-beginnings. This post is interesting, informative, and disturbing. You really did 'your homework' on this one ! Thanks so much for sharing. I will now be more mindful and thoughtful about what-and-where-and-how things began (or begin). That ol' devil "think" he's won and has the victory ... but "we" know the "ending" ... he will NOT have liberty forever !!! Thanks Ladies. I truly hope Washington didn't know the true nature of the Masons. I've learned that only those at the top of the organization are fully aware of the occult ties. Yes, most people don't know this.. and I don't think it has an impact on true believers in this country, but I do think we should be aware. Debbie G, I couldn't agree more about churches not teaching about the occult. They don't want to offend or alarm people but believers need to be warned and be aware. What a shame! Yes society is sliding into wickedness "And everyone did what was right in their own eyes" Praise God... we are His! Great post! I never knew this about our capital building and the monuments. I did know that about the FreeMasons, but for some reason I thought there were the FreeMasons that were occult and ones that were not, meaning different groups of FreeMasons. It ls interesting to realize that I also thought this country was based on Christianity and the FreeMasons had a different agenda. You truly wonder just how many people knew what they really stood for, makes you stop and think. Thanks again MaryLu for this insight to our history that most people probably don't know. Yes, I know about this stuff, but we do need to remember that not everybody who was a part of building this nation was involved with the occult. Like George Washington, there is no evidence whatsoever of him being involved with the occult, but there is evidence like his own writings that prove he was a believer. The creation of the USA was in fact divinely inspired. Look at the story of the crossing of the Deleware. As Washington and his men were crossing the waters they were afraid the Red Coats would be able to see them. All of a sudden a mist came and covered them until they reached shore. Once they reached shore the mist all of a suddenly disappeared. If that's not divine intervention, I don't know what is. If you haven't seen Kirk Cameron's Monumental, I highly recommend it. It shows us the faith of the founding fathers. I've heard these things before and I don't automatically believe all f it. I know from years of research and his own writings that George Washington was a strong Christian. But how like satan to twist that which is real and true to deceive even the elect. That's his Modus Operandi. If you have an interest, I suggest you do your own homework on the FreeMasons and on the various symbols around our capital. I didn't want to believe this either. Like I said above, I don't think many of our founders who were Masons knew what they were involved with. I read that the masons originally formed from the men that built Solomon's Temple. They would teach their craft from generation to generation. A member of the masons was considered to be a man of honor. As time goes by and new chapters are formed, there may have been some corruption in some of the lodges. But I don't think you can categorically call all the Masons evil. I have been to Washington DC and toured a lot of these monuments. During these tours, they explain very different, but equally symbolic reasons for their structures. I guess it is up to interpretation. Wow, that was new to me.I agree, there are many illuminati symbols over there( I'm not very familiar with this occultic movement, but I read about it on Christian YT channels where they expose these things).You never know until you start "digging" into this stuff. Thanks for the info! Hos10:5 The inhabitants of Samaria shall fear because of the calves of Bethaven: for the people thereof shall mourn over it, and the priests thereof that rejoiced on it, for the glory thereof, because it is departed from it. Sorry but America was founded as a secular nation to avoid the religious conflicts experienced in the Old World. There was never anything Christian about it. Incidentally, the 'pagan' style was in vogue at the time, so the designers and artists behind the statues and paintings were simply following stylistic trends. Hmm. You obviously have not read any of the founding father's letters, documents, speeches, or even the Declaration of Independence. Not to mention our national motto, what's written on our money, and all the many many references to God posted around D.C. Nor do you know the early history of this nation where the Bible was required reading in all public schools. Just saying... Yes, the founders did not want the government involved in religion, i.e. involved in dictating religion to the people, but they never meant for that religion should be taken out of our government. A quick read of many of the early documents prove that.